Premier League club Everton FC are planning to make a move for Borussia Dortmund's unsettled star Pierre-Emerick Aubameyang, according to English media outlet Mirror. The Gabon international is reportedly looking for a move away from Dortmund in January and has attracted the interest of various clubs. Everton has become the latest club to get into the market for the striker as the club's new manager Sam Allardyce has identified Aubameyang as the replacement for Romelu Lukaku, who left the club last summer. Aubameyang has reportedly been looking to leave Borussia Dortmund for some time now. The former AC Milan striker had expressed his lack of interest to play for the club by breaching the discipline terms multiple times and was even suspended for it. The 28-year-old's will to leave the club would've understandably increased, after Borussia Dortmund was knocked out of UEFA Champions League this week. The German club has also been struggling in the Bundesliga this season, placed seventh on the points table. Everton had a nightmare start to their Premier League season under Ronald Koeman and eventually replaced the Dutchman with Sam Allardyce. The English manager has identified the club's failure to replace Lukaku as the reason for their downfall. With the January transfer window approaching, Big Sam will be looking to dive into the market in search of a new striker. Aubameyang, who joined Borussia Dortmund in 2013, has been unsettled at the club for more than a year. The former-Saint Ettiene forward could be finally leaving the club in January with several big clubs interested in him. Top Premier League clubs like Chelsea and Liverpool have been linked with the Dortmund striker. A tug-of-war between clubs for the player is expected to take place in January. Everton have been finding it difficult to score goals in the league so far. The Merseyside club's 19-goal tally is the second-lowest tally among the top 10 in the points table and manager Allardyce wants to address this issue in the winter transfer window. It is true that Everton have failed to replace Lukaku in the summer despite spending about £140 million. They do need a pacy striker to play in front of the likes of Wayne Rooney and Gylfi Sigurdsson. 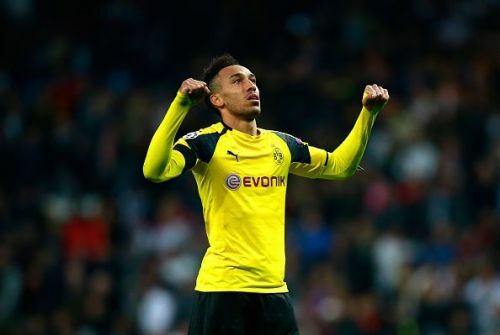 It is also obvious that Aubameyang will be a hot topic in January as he will be linked with several top clubs. His attitude at Borussia Dortmund has made it clear that he doesn't want to be at the club anymore. However, Aubameyang to Everton sounds impossible and probably will remain as a rumour. The Premier League club plays in the UEFA Europa League like the player's current club will soon do, and do not offer anything more than what Dortmund does. The striker can easily find a bigger club than Everton, and the player himself, will be well aware of this.